All faculty, staff and retirees are encouraged to participate in the annual UT Charitable Campaign which launches Wednesday, Nov. 7, and runs through Friday, Dec. 14. 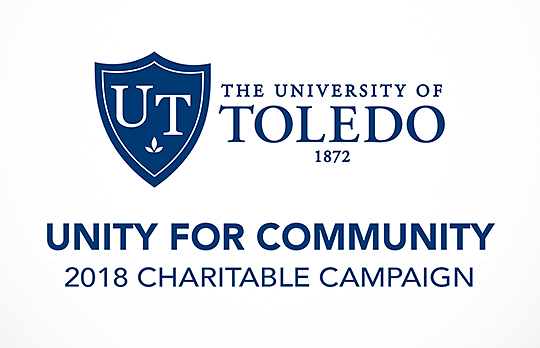 Each year the University participates in this community drive, formerly called the United Way campaign, to collect funds for what now includes four federations — United Way of Greater Toledo, EarthShare Ohio, Northwest Ohio Community Shares and Community Health Charities, which represent more than 200 nonprofit organizations throughout the area. All UT Charitable Campaign gifts are tax-deductible and a variety of payment options are available, including payroll deduction, which does not begin until early 2019. Donations of any size are appreciated, and anyone who submits an ePledge form by Dec. 14 will receive a complimentary gift, plus an invitation to a January 2019 breakfast buffet hosted by President Sharon L. Gaber that will feature drawings for prizes. To make your pledge, watch for weekly emails that contain a link to the ePledge form. Once you submit your completed ePledge form, you will no longer receive additional emails requesting your support. For more information, visit the UT Charitable Campaign website. This entry was posted on Wednesday, November 7th, 2018 at 3:08 am and is filed under UToday .